The Kirstenbosch estate covers 528 hectares, of which 36 ha is cultivated and the rest is a protected area supporting natural forest and fynbos, and a wide variety of indigenous birds, animals, reptiles, frogs and invertebrates. (Download the list of animal species that occur naturally on the Kirstenbosch estate.) The natural area can be explored via a number of walks and trails. Kirstenbosch is adjacent to the Table Mountain National Park, and both form part of the Cape Floristic Region Protected Area that was proclaimed a UNESCO World Heritage Site in 2004. Kirstenbosch also manages two smaller reserves: the Edith Stevens Wetland Park on the Cape Flats and the Tinie Versfeld Wild Flower Reserve near Darling. 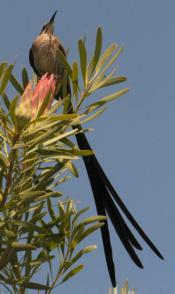 Birds are abundant at Kirstenbosch, particularly in the Garden – more than 125 species have been recorded. Look out for the Sugarbird (Promerops cafer), with its distinctive long tail, Sunbirds (Nectarinia species) with their colourful plumage and the African Dusky Flycatcher (Muscicapa adusta) which is frequently seen swooping down from the trees to catch flying insects. You may also see a Steppe Buzzard (Buteo buteo) flying high overhead. The resident Spotted Eagle Owl (Bubo africanus) is often seen near the Dell. Guinea Fowls (Numida meleagris),Egyptian Geese (Alopochen aegyptiaca) and Cape Francolin (Pternistes capensis) are a common sight throughout the Garden. Many animals live and breed in and around Kirstenbosch, but they are not often seen because they are mostly active at dusk, or during the night, and hide during the day, like the Grysbok (Raphicerus melanotis), Caracal/Rooikat (Felis caracal), Small spotted genet (Genetta genetta) and Cape fox (Vulpes chama). The Cape porcupine (Hystrix africaeaustralis) is hardly ever seen, but the remains of bulbs dug up and eaten are evidence of its night-time visits. Water mongoose (Atilax paludinosus) and Cape clawless otter (Aonyx capensis) live in and around the streams but are also seldom seen. You may see a Striped mouse (Rhabdomys pumilio) scuttling about. You will almost definitely see Grey squirrels (Sciurus carolinensis), an alien species introduced by Cecil Rhodes, and Small grey mongoose (Galerella pulverulenta) in the Garden. 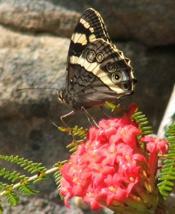 Table Mountain is home to a rich insect life and butterflies are plentiful during summer. Our most spectacular butterfly is the Table Mountain Beauty (Aeropetes tulbaghia), which is attracted to and pollinates, red flowers like the red disa (Disa uniflora) and the red crassula (Crassula coccinea). The insects that live in the streams are specialised to cope with the swift flow, low light, acidity and low nutrients of the water. You will find Dragon Fly and May fly nymphs, Caddis Fly larvae, Black Fly larvae and amphipods. Kirstenbosch is home to several amphibians, including the Chirping Frog (Arthroleptella lightfootii), which can be heard, if not seen, on the Braille Trail, the Cape River Frog (Rana fuscigula), which is often spotted in the streams, and the Critically Endangered Table Mountain Ghost Frog (Heleophryne rosei), which also occurs on the estate. Angulate Tortoises (Chersina angulata) are frequently seen on the lower slopes and in the garden. The Marsh Terrapin (Pelomedusa subrufa) occurs in the ponds and streams. Lizards are also frequently encountered, you may see a Cape Crag Lizard (Pseudocordylus microlepidotus). Snakes also occur here, but are not frequently encountered. You may see a Mole Snake (Pseudaspis cana), Boomslang (Dispholidus typus), Cape Cobra (Naja nivea) or Puff Adder (Bitis arietans). Many other reptiles, including the Cape Skink (Mabuya capensis) and Marbled Gecko (Phyllodactylus porphyreus) also occur at Kirstenbosch. Fresh Water Crabs (Potamonautes perlatus) inhabit the ponds and streams and are also seen walking overland – they can do this because they fill their gill cavity with water, which enables them to breathe as they travel overland. For more information, download Havens of Biodiversity (PDF), a booklet describing biodiversity in the nine National Botanical Gardens of South Africa.